Podcast listening is hot — so much so that folks are boasting about bingeing on podcasts more than Netflix or ice cream and consuming content when they have time. In 2018, individuals can listen to podcasts on the go — and en masse — by listening anywhere, at any time, to the exact podcast episodes that they desire. “Bingeing” on entertainment became popular when both Netflix and DVRs allowed television viewers to spend entire weekends catching up and watching full seasons of shows, instead of waiting one week or more in between new episodes. That same method of consuming entertainment naturally was adopted by podcast users. Podcast fans have begun binge-listening to their favorite podcasts at home, in their cars and everywhere it is appropriate to pop in ear buds or listen via speakers and escape to another world. Podcast fans who binge-listen to the same podcast all at one time often listen to storytelling podcasts that are continuous and reveal one specific story across all the episodes. Suddenly, a six-hour solo train ride home and back for the holidays doesn’t sound so bad when you have podcasts like S-Town, Serial or Shattered: Black Friday, an unsolved mystery podcast, to keep you company. Storytelling podcasts with continuity can be heard via the website hosting the podcast, or through conventional podcast apps. There are a number of ways to binge on podcasts as the popularity of the procedure grows. Whether visiting common locations like iTunes, Google Play, Podbean, Stitcher, Spotify or websites like Variety that host their own podcasts, consumers have plenty of choices. With new tools being offered to meet their needs, podcast listeners can also binge on specific topics without jumping from website to website to try and find appropriate podcasts. Podcasts have been unbundled, similar to the way songs have been unbundled from their albums, so there’s no need to be locked into listening to extraneous material. Podcast bingeing lets listeners gain in-depth knowledge of a topic within hours. For example, a prospective promotion might require that you learn about derivatives in a short period of time. Searching for derivatives on Listen Notes reveals a variety of podcast episodes about the topic found within different series, which can all be placed into a powerful playlist to help you “download” as much information about the topic into your brain as possible during commutes to work. Suddenly, binge-listening to podcasts has made you an expert on a topic in the eyes of your boss. You can binge more efficiently through this advanced technology: Listen Notes lets podcast users find episodes and curate playlists via Listen Later for additional features. What are the benefits of bingeing on podcasts? Why would anyone want to binge on podcasts? The reasons are wide and varied. First off, whether you are the driver or a passenger of a vehicle, most folks find podcast-bingeing to be the perfect pastime for a daily commute — or ideal for long summer road trips — because you don’t have to take your eyes off the road to consume the scenarios being painted by your mind’s eye or the jokes flowing into your ears. Storytelling podcasts work great in these instances, such as Slow Burn: A Podcast About Watergate, or Death in Ice Valley. Other people enjoy bingeing on podcasts because they prefer auditory learning and enjoy it more than reading books or using videos to take in new interests. Instead of being visual learners, they binge-listen to podcasts for entertainment reasons, as well as to help their careers and relationships via what they hear. Bingeing on podcasts helps people multitask while learning new information — about Bitcoin, or self-driving cars, for example — to get more value out of their days. They can still mow the lawn, do the laundry, or perform other tasks, so bingeing on a podcast doesn’t distract from their daily duties. Podcasting is a great media format to learn more about a person when researching an individual. Be they a sports star, venture capitalist, startup founder or a politician — you can find their data via the Listen Notes podcast search engine. From information about actress Suzanne Somers to podcasts mentioning the Chicago Bulls, the information is at your fingertips. Podcast listeners may have been wrongly pegged in the past as geeks who obsess over NPR all day, but podcast listening and bingeing has become commonplace. Any person can take advantage of binge-listening in order to unveil more about a thing, person, movie, topic, country, city, an area of interest, new field of study or a hobby. 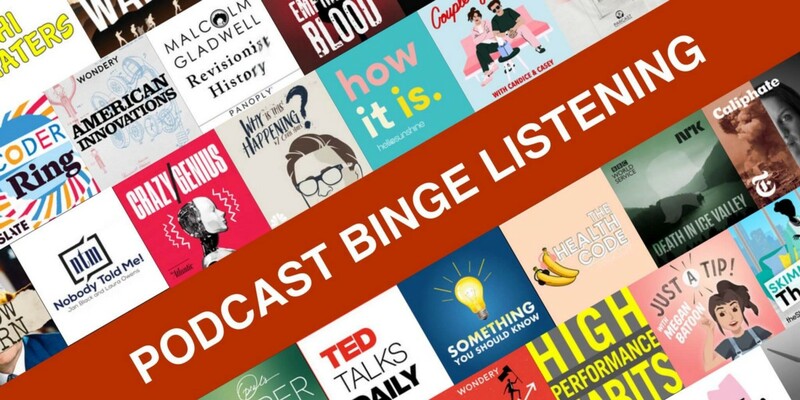 It’s not just for pleasure or for listening to the podcasts “you love while doing the things you love.” Podcast bingeing can help you dig deeper into subjects that can help your life and livelihood flourish. Journalists binge-listen to podcasts while researching topics and individuals. Entrepreneurial startup founders can discover background information about investors by discovering all of their podcast interviews. Interviewers and podcasters can hunt for prospective guests by binge-listening to other podcasts — and in doing so discover revealing new queries to avoid asking the guests the same questions on their show. Now that advertisers and podcast creators recognize that people are seeking new and varied ways to consume their favorite and emerging podcasts, the tools to listen to those podcasts are advancing to keep up with the wishes of users. On one hand, more and more storytelling podcasts like S-Town, Serial or Shattered: Black Friday are encouraging people to binge on compelling episodes with cliffhanger plot points. On the other hand, unbundling podcasts is a growing trend — and Listen Notes is well-positioned to provide the necessary tools to help people binge-listen, discover new podcasts through the podcast search engine and even curate podcast playlists via Listen Later.